This Black Double Sided CLB Slim Bin has thirty six quick change baskets for easy refilling. Double sided displays give your business more space to show your items. This black display stand is great for showing more product than typical gridwall displays. More products mean more sales. The perfect freestanding metal stand for impulse materials such as snacks, candy and more. All these baskets also work well for smaller hardware items. With a two sided display you get the convenience of keeping all those smaller items within reach of customers. 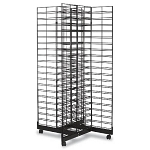 The wheels on this display make it easy for you to move to different locations in your store. Order now at Candy Concepts Inc. and put your bet on this dual display stand. 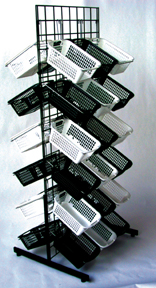 This Double sided grate with baskets is perfect for an office project / display area. However, the baskets came in a box with no protection and from shipping/handling many of them are broken and cracked on the edges. The baskets are still able to be used but it is not as professional or nice looking with the broken and cracked corners. Would recommend to ship baskets in a bigger box and put protective shipping material in box to protect the baskets.